This year the summers have been extremely cruel in Northern India. With temperature soaring above 45 degrees, we have no choice but to stay indoors. It has been especially difficult for school children, who have been granted a two-month vacation through the end of June. 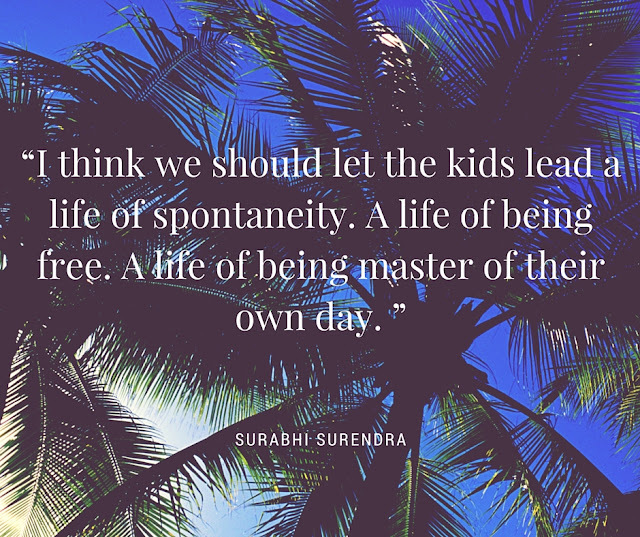 During the first week of the vacation, the days did not feel this long, but as the heat wave continued and kids began to get ‘bored’, mothers in my neighborhood started hunting for viable, nearby summer camps. Later I learnt few more kids from my neighborhood had joined the camp. It definitely sounded exciting. Two hours of solace for me in the morning! Two hours of time in the middle of the biggest rush during the day! But there was a problem. My kid gets up anytime between 10 am to 11 am. It is heart warming to see her sleep at a long stretch – a luxury not available to her when she goes to school. During school days she gets up by 6 and leaves home by 7am! Since it is very hot here, by the time she gets up, bathes, eats breakfast and finishes her morning chore, it is 1pm and almost half of the hot, muggy day is gone. Now she gets ready to play in the evenings. I took time to understand it. I feel kids don’t have to ‘do’ anything, they are kids. She is just 6 years old! But now I understand their concern is about ‘how she spends time without getting bored’. I answer ‘nothing’. My kid does nothing in her summer vacations and I am absolutely fine with that. In fact, this is what I have wanted for her during her holidays. I wonder if kids have to do something. Does this ‘doing’ add any value to their tender minds? Why have we become obnoxious about the word ‘nothing’? Since when has ‘something better than nothing’ become a gospel in parenting? I have nothing against the parents who enroll their kids in classes. It works for them and I am happy for them. But, I would prefer to give a break to my kid from the world of classes! I am perfectly fine with the fact that my kid spends 11 hours in bed. After a month, the poor girl has to go back to her daily grind of getting up early. I am absolutely okay that she is living an unscheduled life right now – for a month! I think parents have forgotten the pleasure in doing nothing. Or have we? Because when it comes to ‘me’ time, what are we secretly wishing for? A few hours of doing nothing. In times of helicopter parenting, not only do we hover over our kids, even during their holidays, we always try to bind their innocuous lives in a schedule. In short, we kill the thrill of living the day as it comes and make their lives mundane and monotonous with always the same, getting up early, going to the camp, doing a few activities, and planning for the next day. Shouldn’t we let the kids decide what they want to do in their long days? Shouldn’t we let them explore the value of ‘nothing-ness’? For her ‘nothing’ is an entity that she is busy exploring in her vacations. 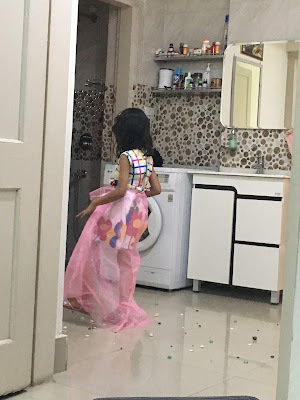 My kid loves to drape a net fabric around her waist, wear her new sparkly sandals, throw on few colorful paper balls and then trod around the litter like she is a queen making her way across a flower spread carpet. If she is not doing this, she is busy role playing with her girl-friends, either in her room or in their rooms. Sometimes she is simply spending time by herself when she will walk up to me every fifteen minutes with a question weirder than the previous one. It is only due to this nothing-ness that she often goes back to time and picks up pieces that baffled her then. It amazes me how easily she brings up an incident that occurred a fortnight ago and this shows that while she has moved on practically, her mind hasn’t untangled the incident yet and hence she needs an explanation. I am thankful for this zero exploration that helps my tiny tot to unravel what goes on in her vulnerable mind. I am happy that during this nothing-ness, she explores her own thoughts and emotions. Having my kid at home for the whole day drives me crazy sometimes, I agree, but it gives me the pleasure of watching her grow at her own pace, with a mind of her own. Doing nothing is not wasting time. It is letting the time settle down on its own. When we were young, we didn’t have the concept of summer camps. We lived a life much similar to what my daughter is living right now. A life of spontaneity. A life of being free. A life of being master of her own day. And this is what I want for her not just this holiday but all the holidays to come. When I started reading the post I was somewhere in my mind preparing myself to start a debate with you on this topic. But till I reached the end I was ultimately convinced with what you said and meant. And realised the Power of Pen !!! Your little kid is just 6. She shouldn't be imparted with the fear of survival in this world. She will herself explore a lot like this. Hey.. how you doing? I sincerely believe in the power of self-exploration. Let her discover the beauty on her own. You are right.. I have a daughter she’s s just 2 yrs old. And coz she had started speaking at an early age people ask me to get her admitted to a play school. But somehow I don’t want to .. coz I want her to explore things and learn them on her own. That’s the way they should actually learn things… On their own ..with a free mind. Thank you for writing here Deepali. I know I faced the same dilemma when my daughter was 2-3 yrs old. I think in the end we should trust our own instincts and thats it. If you feel your baby will learn more at home, keep her at home. Thats the best for her. I don’t send Pahal to summer camps etc because I let her decide and she chooses to be at home. Hi. It is great when your kids are involved in some activities and develop new skills.research paper writing service Hope you do well.